How Easy Is It to Write a Make-up Artist Biography? 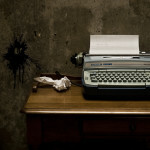 Even if you are skilled with words you may find writing a makeup artist biography or photographer biography hard work. Most people find it difficult to describe themselves and with the added problem of trying to it within such a short piece of work it can be doubly difficult. Your biography is far more than just a list of qualifications, experience, and skills like your resume, it is a highly personalized view of you as a person and should be carefully tailored according to the purpose of the biography. A biography that you use to enhance your resume is going to be very different from one that you have on your website. 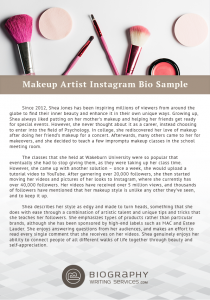 What Should Your Make-up Artist Biography Cover? 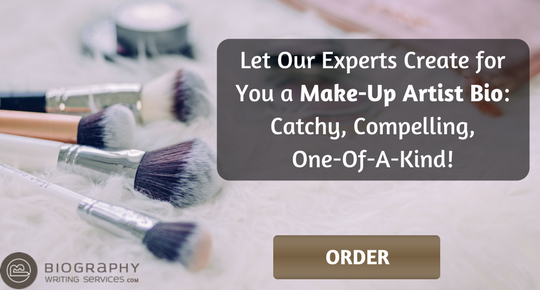 Your makeup artist biography needs to be carefully written to meet the specific needs to which you are looking to apply it, like for LinkedIn you may need the help of LinkedIn profile makeover services, so if you are looking for something to add to your resume then it needs to clearly sing your superior abilities and experience. Here we will talk about the importance of your artist bio as a makeup artist. It is mainly a short paragraph weaving your art career, all of your talents, your achievements, and credentials. We cannot stress enough on the importance of this emissary. Now, you have everything that is needed while you are thinking about your bio, the thing which left is to perfect and write your artist bio. Seems quite an easy right? Specifying your service or niche. You must have a specific niche or profession, and you are known for it, then you should make it clear in your bio so that you can connect and interact with the right crowd with the help of your bio. Experience and skills. If you want to present a professional business and want to build trust among the audience then you should share your skills and experience in your bio. Interests and hobbies. You need to build a relationship with your audience and for doing that you have to share more about you. You interests, beliefs, values, and hobbies. Your make-up artist biography need not become a headache for you. Through our highly specialized writing services, you can be in touch with a highly skilled writer with the experience to draw from you all of the information required to craft a highly effective bio. We trust our writers totally which is why we provide you with a full money back guarantee on all of our biography writing services. Discover all the niceties of creating an impressive business company profile! So if you need to have a highly outstanding personal make-up artist biography that is going to exceed your own expectations just get in touch with us today! « What Makes Great Executive Biography?